The other night I was trying to think of something to make and I remembered the stack I got at Michaels over the weekend and thought I would do some gift bags. I posted a picture on Facebook and immediately my friend Khrystal said she needed the giftbag, and stated "I actually need 6! I will pay you!". The dang thangs *okie still laughs at saying dang thang and so loves saying it* were sold before I even got them done! She wanted some names put on them and messaged me the names. The big one is for her daughter. I did 5 small ones for the other girls. I attached the ribbon at the top with my Tim Holtz Tiny Attacher. It worked great for this purpose and I think Tim would be proud! I cut the names with Feeling Groovy. I wanted that cart as soon as I saw it when the Cricut Lites came out but it took me awhile to get it. Now that I have it I use it quite a bit! I used my IRock to attach the heat set gems. Many people have asked me where I get my gems and I get them off eBay from a seller named OHMYMINI. I tease that they come via a slow boat from China, but it really does! It takes awhile to receive them but they are well worth the wait, especially for the price. Love the idea, paper and colors -- you may have used your iRock but really it's that OKIERocks! These are so posh -- they look like they are right out of a boutique. BTW - I think just the word 'dang' by itself is hilarious too! Are you kidding me? 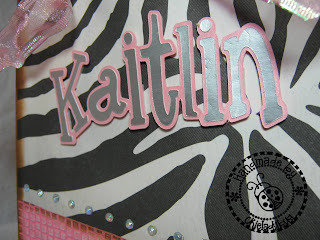 With that gorgeous shimmery pink ribbon, the animal print, the texture, the wonderful pink/black/white colors, and the *BLING* ... I can't blame Khrystal one bit for demanding ownership of these adorable bags so quickly ... and requesting more to go with them! love button.....wheres the love button? 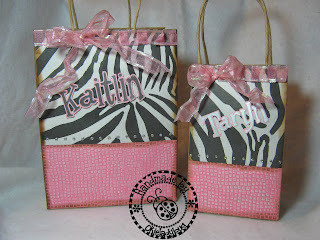 Designer gift bags from the infamous Okieladybug! Next, you will be on HSN! The pink paper looks great with the zebra stripes. She definitely got unique bags to use! Love these bags Okie, They are so cute. Of course I love almost anything pink. Who ever get these bags are going to love them. Cute bags! I'm sure the girls will love them! TFS! I didn't get the Feeling Groovy cart cuz I refuse to pay $40 for a lite cart, but I did find the Groovy Times cart for a decent price a while back...fun cart! I need to check out your link for the gems and buy myself an Irock...I've seen so many using it. Love these bags. Although now I've been forced to go to ebay and order those rhinestones! ENABLER!!! Those are really really cute bags Okie! FAB U LOUS BAGS !!!! 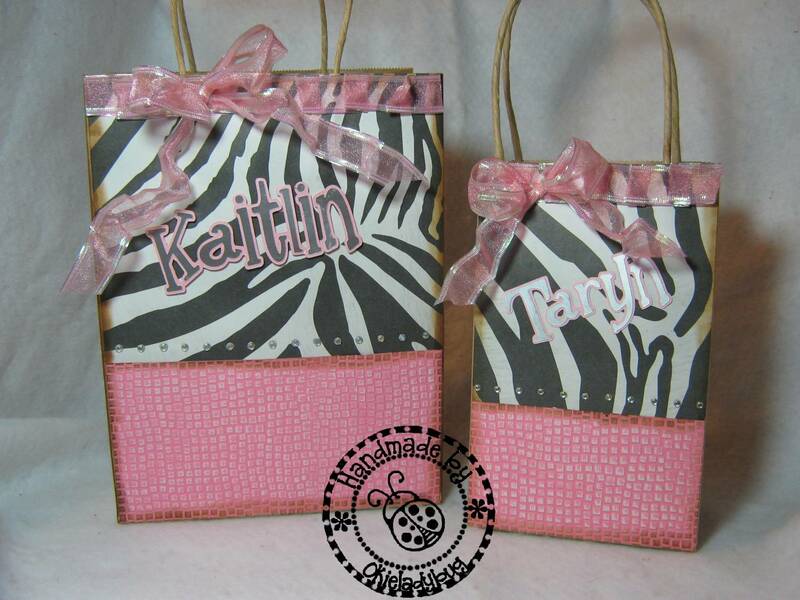 My niece loves zebra - she is so totally going to want these! Thanks for the enabling link (haha - love it) But, not sure which rhinestones are the right ones. They didn't say they could be used in the irock. Are they the lot of 2400 flat rhinestones? TFS you great projects. What girl wouldn't love these bags. They are fabulous. I went back on the site of "OHMYMINI". Click "visit my store" and there is a category on the left that says "hot fix" when I clicked on that 4 sets of rhinestones came up and the description said they could be applied with a hot fix applicator. Are these the correct ones Okie? PGH those are the right ones indeed! I need to quit calling them heat set and start calling them Hot Fix so people dont get confused. Thanks! I gotta go and order one in every size - lol! You are the little enabler!